More and more Chinese live in a nation that looks nothing like it did a decade ago. The transformation rivals anything envisioned in Mao Zedong’s revolutionary credo of 60 years ago, yet it has also highlighted new “contradictions among the people,” forcing a widespread search for novel forms of social harmony. 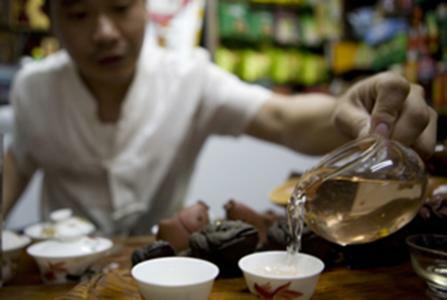 Ye Huabin welcomes customers to his shop with a cup of tea as a sample. After picking tealeaves in the fields, Ye now owns two shops in Beijing. Thanks to China's booming economy, more Chinese can afford gourmet tea these days, and Ye Huabin says his business is on the rise. Once a tea farmer in Fujian province, Ye now runs two tea shops in Beijing. For a generation raised on MTV rather than Mao Zedong Thought, Buddhism, along with other traditional Chinese ideologies such as Confucianism and Taoism, offers young people a way to reconnect with their Chinese identity in the face of increasing globalization. Bian Da Cheng stands outside his shop on a weekday afternoon. "It was our own personal choice to open the business," Bian, 54, said. "We have little pressure to make money; we are already retired. We are doing this to consume our time." Beijing shop owners Bian Dacheng and Liu Zhiying find their freedom in China's open market.